This was drawn with a 0.5mm mechanical pencil, on a 8�" x 11" High Bright (87) smooth finished paper. Finished off with a thick layer of Workable Fixatif. Anyone who is a shipper has seen this pic posted all over the net. I don't think I have ever seen a shipper site that doesn't have this pic posted. U don't have to ask me why I drew this *g*. (O: Ok, naaaw that isn't it. 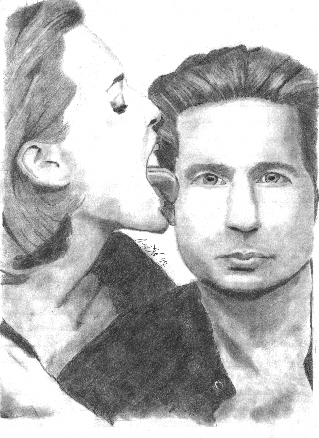 I tried drawing mulder first and then Scully. Mulder, ( like I said before) is so hard to draw, I seem to have problems with the bottom part of the face, oh, wait the eyes and the lips too. I guess I mean everything *l* I don't think I captured him too good here. Spank me!